Mr. Arkadiy Bagdasaryan received his BS degree in Marketing from Kingston University (London, UK) in 2012. He started his professional career in 2005 as a Sales Manager at A.K. LLC (Greece). 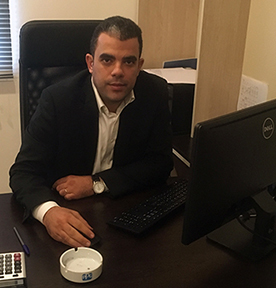 In 2006-2009 Mr. Bagdasaryan worked at SERANO Company (Greece) as a Logistics Manager & Import Export Manager. In 2009 Mr. Bagdasaryan became General Manager at SERANO Company (Greece) till 2011. In 2011 Mr. Bagdasaryan founded: BS Georgia LLC (Georgia)– a wholesale/retail company and served as a director till 2014. From 2014 Mr. Bagdasaryan is General Manager at Caucasus Paints LLC and member of the Executive Board of Caucasus Business Group, JSC.